Island Time. Everyone has their own definition of island time. For the get-away-from-it-all vacationer, it may look something like an island dream, not a worry in the world, unplugged from the news, off the Internet, no concern about their bills or what's happening “back home”. They want to wake up late, have a lazy morning, and do whatever strikes their own fancy on that particular day. That's island time to them. For local workers, island time and island life is really a bit closer to everyone else's lives, but not exactly. They do live on an island after all. But they get up every morning and go to work, do their jobs, and go home and live their lives. They definitely do this at their own pace, affected by but not ruled by, seasonalities of the workload (tourist high season, etc.) or the natural ebb and flow of “busy” at work. 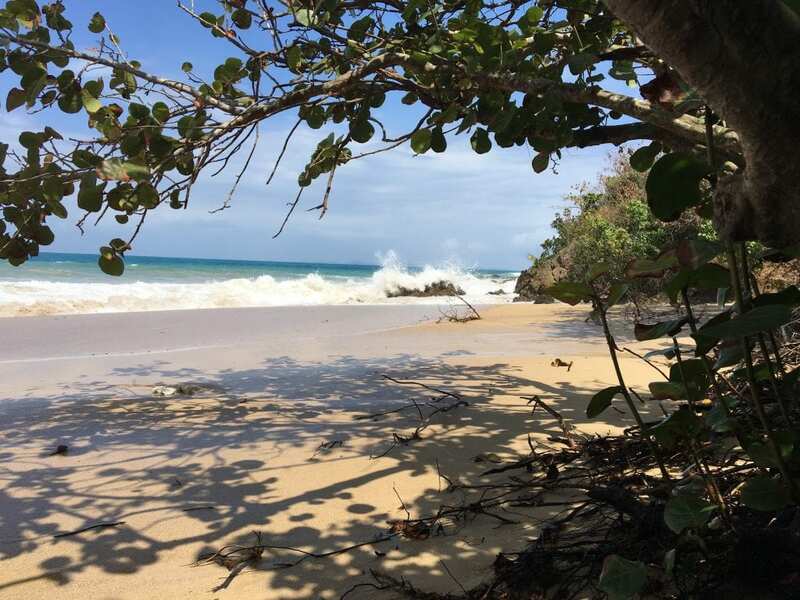 Here on Vieques the winter is supposed to be high season, but this year that tourist peak has been tamped down by the hurricane damage and the continued recovery. The tourists just aren't coming here in near the normal numbers, and we can't really blame them – the place, in part, looks like the perfect birthday cake that the dog got into (it still tastes good though!). In response to the loss of business (at least that's what we assume), many shops open at 10, close for lunch, back in the afternoon, and then shut it down for the day at 4 pm, or even 3pm*. After 4 pm on Fridays, the traffic on the main street in town disappears and people start congregating outside the groceries with a cold beer and a smile. Island time. *Note: not all people and all jobs look like this. My neighbor is a man in his 30's with a wife and 3 kids, with a nice house and 3 nice cars. He leaves for work every morning at 5:15 am to catch the morning ferry over to the mainland, and returns about 12 hours later. 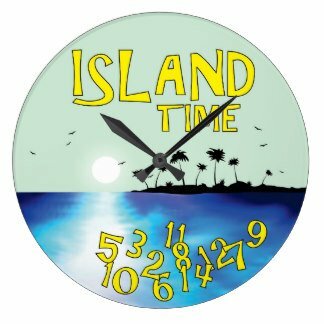 So his island time looks a lot like NY time or Miami time. Hi ho, hi ho, it's off to work they go! We have our own definition of island time as well, which we've discussed before in this blog. We aren't on a schedule at all, unless we need something at a shop or the post office. So we haven't rushed around to hit every beach, every bar, and every historical site in our first 8 weeks here. We're visiting them at our own pace and enjoying the journey. I'll admit that our lack of a car has an impact on this, it certainly slows down our ability to pop over here, pop over there, and check things off our island exploration list (uh, there is no list but maybe we should make one. Nah, haha!). And we are looking for a car, but the people we've talked with (friends, rental agents, acquaintances) aren't really jumping on it and tossing multiple options our way. We don't want to get one of those that was flooded from the hurricane either, so it's a slow process. While that goes on, we cruise about on our bikes and on our own four feet (12 if you count the dogs! ), on island time. Now, this isn't to say we haven't seen anything around this rock, we certainly have. One of our favorite haunts (pun intended) is what we call Cemetery Beach - if it has a real name, we don't know it. It's a short walk for us from our neighborhood, and takes us through the cemetery (BTW, all island cemeteries, and airports for that matter, seem to be on the water). 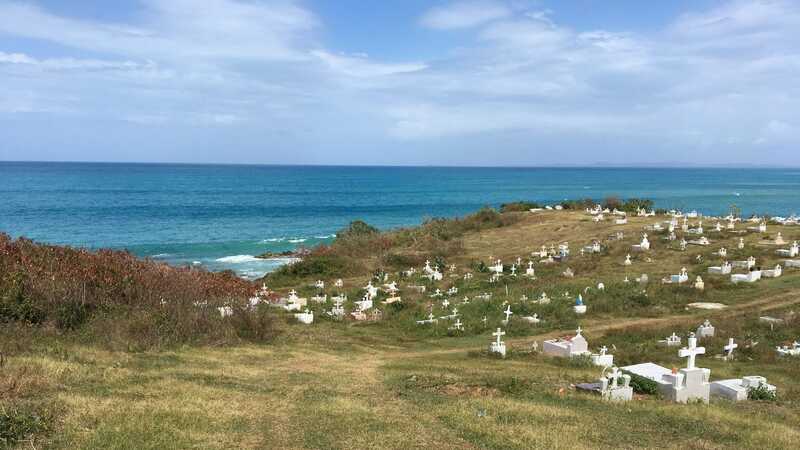 The views of open ocean, rocky cliffs, and sandy beaches are truly spectacular from the cemetery high on the hill, and sometimes we'll see someone just sitting on a crypt there and enjoying those views. I'm sure the residents don't mind – they know their view is the best around. But we usually walk on through and go down to a small beach, a couple hundred yards long, with rocky outcrops on either end. 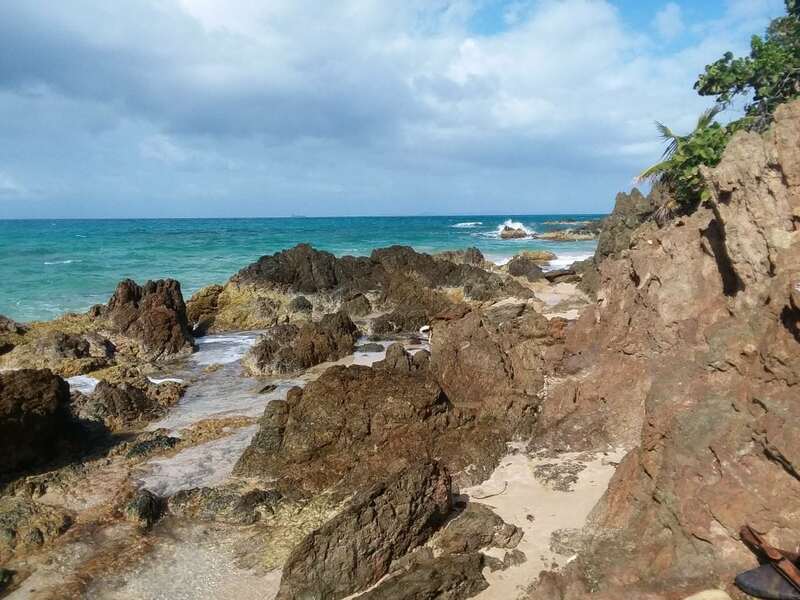 This is on the north shore of Vieques, and the views from here across the waters of the Atlantic are of the Puerto Rico mainland to the left, the island of Culebra to the right, with the great North Atlantic straight off in the distance. If we could see that far, and over the curve of the Earth, we'd be looking at Maine, or maybe Nova Scotia. But in real life, you can see waves churning white foam out on the offshore reef and a variety of boats passing through. 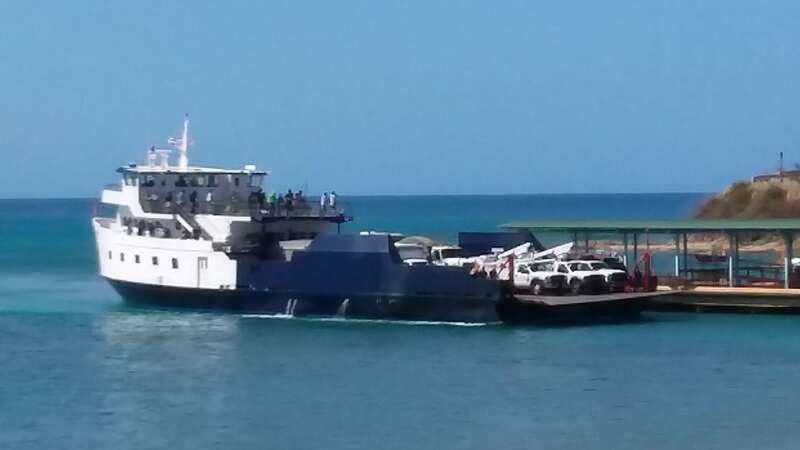 Sometimes it's a high-speed Coast Guard boat, or maybe the municipal ferry to the mainland, but usually it's a fishing boat just doing it's job. This isn't a swimming beach though, there are too many rocks and too many waves for that, but the coral, shells, and sea glass we've found there is inspiring, very beautiful. Not far from the cemetery but far enough that it's a 15-minute bike ride instead of a walk, is El Gallito, the little rooster beach. On the ride there one day we stopped to fiddle with a kickstand on my bike, and this old man in a pickup truck stopped to ask if we needed help. We assured him we were fine but he didn't want to leave, he just kept talking to us. I think he really just wanted to talk. Then, he pulled out a beer he was drinking followed by a cute little piglet to show us! He started feeding it from a bottle while he chatted with us! So maybe he just wanted to show off the little piggy? Island people! Well, El Gallito is also called Gringo Beach, but we don't know why; as many Puertoriquenos go there as gringos. Many Vieques beaches have multiple names, but most of those are remnants of the names the Navy used when the beaches were bombing targets or just landmarks to get their bearings (Red Beach = Playa Caracas, Green Beach = Punta Arenas, etc.). We're not fans of those Navy names because they have no meaning to us, but they hang around. El Gallito is only a mile from the end of the VQS airport runway, which gives us great views of small planes taking off over the water on their way to San Juan. On one end of this quarter-mile-long stretch is a point where people park and just take in the views, especially the classic over-water sunsets. On the other end, there's another outcropping of rocks where the waves crash onto the shore. This is also the edge of the W Resort property, which has been closed since the hurricane and is unlikely to open again this entire year. 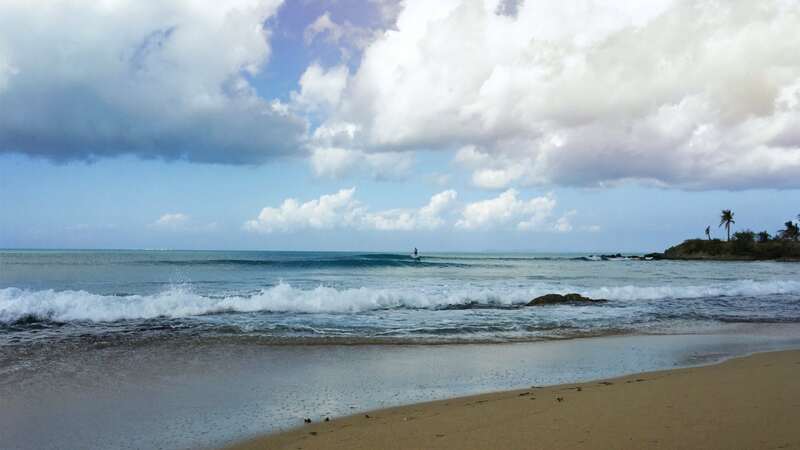 The rocks on this end of the beach create a natural surf break and we enjoy watching the surfers and stand-up-paddleboarders ride waves all day. Nearer the point we can swim and chill in the water, but there are smooth rocks on the bottom in many places where you'd be standing. 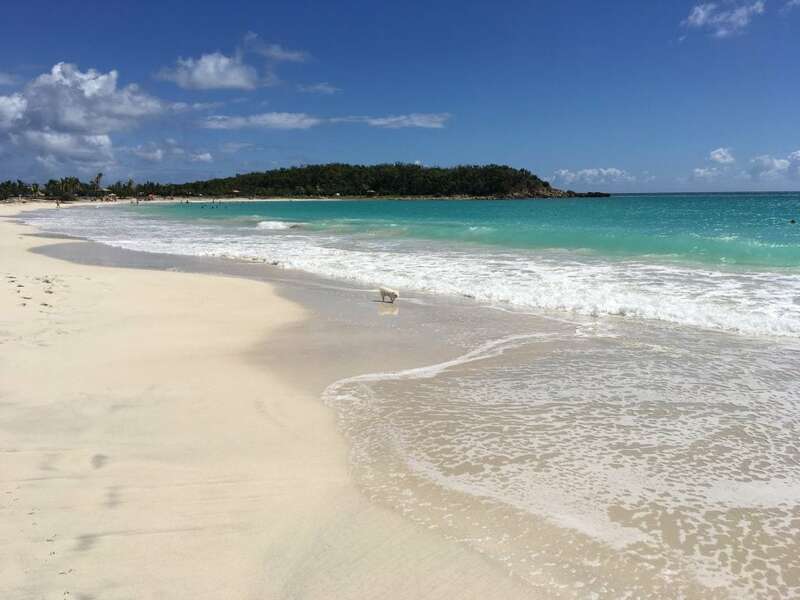 By the way, the sand on most of these north shore beaches isn't the glorious white sand of the Caribbean side, it's more of a golden amber, but it is wonderfully soft between the toes and we do enjoy this beach. On the south side of the island are those gorgeous, and I mean world-class gorgeous, Caribbean white sand beaches. They are also bikeable, less than a half hour to most of them but over a steep ridge in the center of the island. Unspoiled by development, many of them are in control of the U.S. Fish and Wildlife Service. This means they should remain this way for years to come. So far, our favorite is probably Playa Caracas (although we can't wait to see what new ones may change our minds). The tides, winds, and waves can really affect how we view a beach, so multiple trips are required to properly evaluate a beach. It's a rough life I tell you! Caracas is also about a quarter mile long, and also book-ended with rocky outcroppings on either side. I actually shouldn't bother describing the beaches this way because almost all of them are bordered on each end with rocks which define the individual beach. These are not like the endless sands of Florida that go on for miles and miles, and usually only interrupted by an inlet or a jetty. But Caracas is truly beautiful, and has healthy waves in the right conditions, growing larger toward the west end. But toward the east side, a point wraps around and protects the beach, resulting in much calmer waves and better snorkeling there. There is also good hiking around the rocks all around in this area. 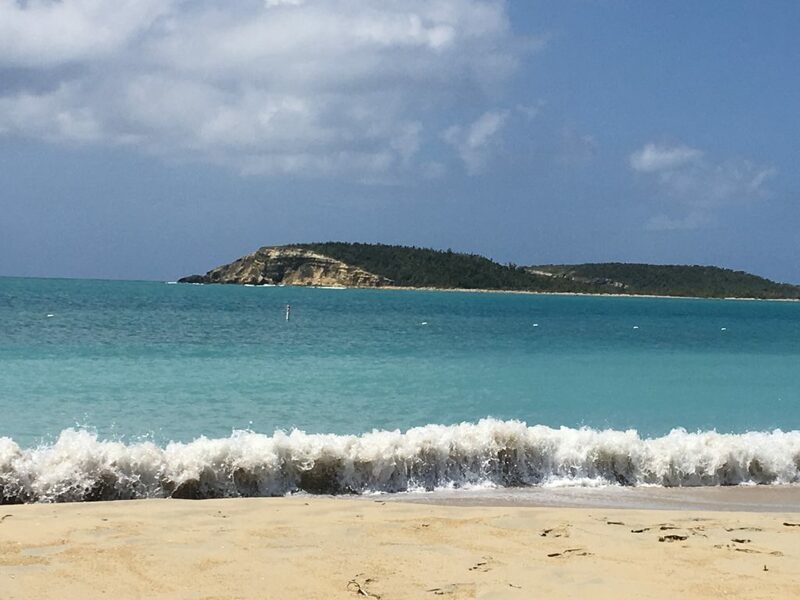 Another gem on the south coast of Vieques is Sun Bay, over a mile of golden sun, white sand and beautiful blue-green water. Under the jurisdiction of the Puerto National Park System, it usually costs $4 per car to enter and park at this beach. Since we've been here though, they haven't been able to run the facility so aren't charging for entry. The exit gate is just left open for people to come and go. 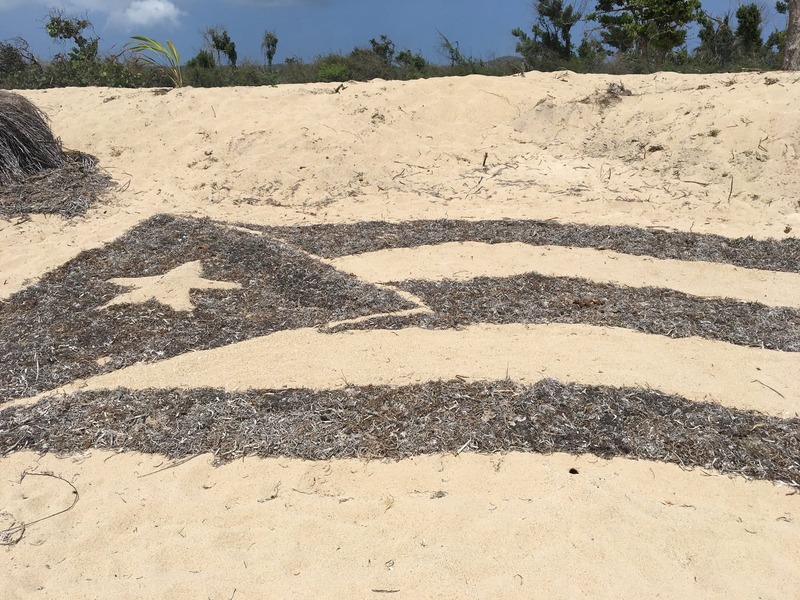 Regardless, if you are in the barrio of Esperanza you can simply walk along the beach around the sandy point and go to the beach at Sun Bay. The ease of access also explains why there are so many horses on this beach and the surrounding land. They make for interesting sights as they horse around on the beach! This time of year there are several young foals, hardly bigger than a dog, following their mothers around, it's such a sweet sight! So our island time includes beach time, but it's not ALL beach time! Sometimes we have to go to the waterfront bars, ha! But seriously, we still have our bike runs to the post office, the grocery store, and the store that sells beer by the case. We have laundry (no dryer) and dishes (no dishwasher) and yard maintenance (no lawn mower) and bike repairs (no power tools). And we do have our Friday night drinks with friends. Once we get a car, we'll have access to many good fishing spots, and more beaches! And when USFW is able to get more of the reserve open, many more beaches will be waiting for us as well. It may have to do with budgets and bureaucracy, but it could also be that those people have a bit of island time built in to their restoration schedule. I'm going with that. Island Time explains a lot around here. Do you find yourself getting a lot more recreational reading done, without that pesky job cutting into your free time? If so, what are you choosing to read? Have your tastes changed since you have more free time? I’m not reading any more than I did, except maybe more online stuff about retirement and finances. Oh, and the endless stories that are posted about this island. You can’t keep up with it all, and much of it is negative so I don’t dig too deeply there. I guess we do read more when the power is out, which has been often lately. Probably half the time in the last week. But I still read Randy Wayne White and Carl Hiaasen, that sort of thing. I wouldn’t say our tastes have changed, what’s changed is the opportunity to do what we want on our own time. While I “own” several expensive assets – airplane, houseboat, condo – it’s timeshare. And cheap. Could there be an “automobile co-operative” on the islands? Check it out. The water looks so beautiful. I’m hoping the bioluminescent bay is healthy when I come out there. I’ve always wanted to see that. Miss you guys. So happy you’re living your dreams. Hahahaha, no Uber. The closest thing is a van taxi, that we can call or flag down.